Customer designed home theaters with the latest and best brands only. Let us create yours today, starting at $3,900 (including installation). No need to leave home to get that movie theater experience. Your home theater can offer comfort, crisp images and powerful sound when you enjoy movies, television and gaming. Versatile design. 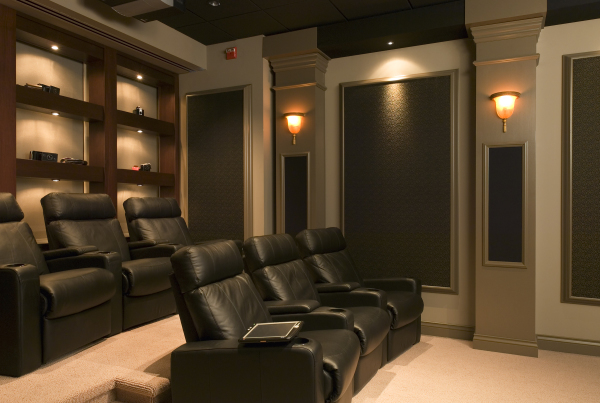 Don’t sacrifice the aesthetics of your home when selecting a home theater. We’ll help you create a bold design that makes your screen stand out, or choose a more subtle look with a screen hidden in your drywall or ceiling. Control in your hands. You choose the best way to guide your experience, ranging from a standard remote control to a smartphone app to oversee your technology. Audio versatility. Play the same audio throughout your home or control your selections by room — it’s your choice.